Gleaming new plum-blue seats. Intelligible, accurate automated station announcements. A smoother ride with maximum heat and air conditioning. Those are some of the features MBTA Blue Line riders can expect to see as the first four of 94 new subway cars, each costing $1.8 million, began operations yesterday. They are the first new cars to serve the Revere-to-downtown line in 29 years. By summer, T general manager Daniel A. Grabauskas promised, riders will be able to count on nicer cars and more of them. Six-car trains, 50 percent bigger than now, will begin operating on the Blue Line during the morning and evening rush hours, giving commuters and luggage-laden travelers heading to and from Logan International Airport badly needed breathing room. Although millions of dollars in renovations remain to be completed at Government Center, Maverick, and State Street stations, the critical work of extending passenger platforms to accommodate the longer trains has been finished at every Blue Line stop, T officials said. While there is good news for Blue Line riders, and Green Line passengers will be able to enjoy a handful of new Italian-made trolleys this spring after months of mechanical glitches, it could be anywhere from five to eight more years before riders on other lines see new cars, Grabauskas said. "We're literally in the process right now of developing a request for proposals for new cars for the Red and Orange lines," Grabauskas said, pointing out that the Blue Line cars, made by a division of German industrial conglomerate Siemens AG, have been in the works since 2001. 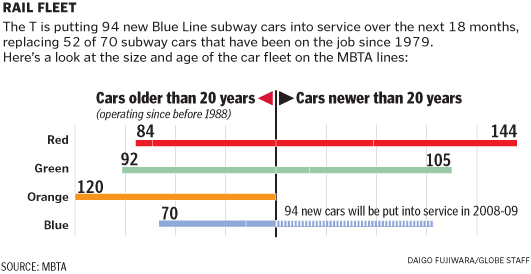 When all 94 new Blue Line cars are in service, sometime in late 2009, the Orange Line will have on average the oldest fleet of the four T rail branches. The Orange Line's 120 Hawker-Siddeley cars were put into service 27 years ago. They are close cousins of the 70 slightly smaller cars now used on the Blue Line, all built by the same Anglo-Canadian manufacturer. Eighteen of those 70 old cars will be kept and used indefinitely, to fill out the 112-car fleet. Most cars on the Green and Red Lines, the system's two busiest, are 20 years old or younger, with some exceptions, according to T records. The 10 vehicles on the Mattapan High Speed Trolley branch of the Red Line were all built in 1945-46, but were refurbished last year during a $47 million overhaul of the Mattapan-to-Ashmont line. The 218-vehicle Red Line subway fleet includes 74 cars that have undergone top-to-bottom reconstruction since they began service in 1969. Local, state, and federal transportation officials gathered early yesterday at the Aquarium station to snip a ceremonial blue ribbon and step on the inaugural run of the new Blue Line cars. Richard Doyle - regional chief of the Federal Transit Administration, which is covering 80 percent of the price tag - said: "You're going to have a terrific experience." Riders generally had rave reviews for the new cars, with the only complaints coming about the seats, which are hard fiberglass instead of the black vinyl cushions of the existing Blue Line fleet. T officials said the seats on the new cars are each about 2 inches wider than those in the 1979 cars. What they left out was that there are fewer on each car: 35 seats and a wheelchair space, compared to 42 seats with no wheelchair slot on the old. "I think they're really nice," said Roger Pollard, who lives in Revere's Point of Pines and rides downtown from Wonderland every weekday. "The seats are a little hard, but the rest of the train is nice. I like the newness." "It seemed so clean I was afraid to step on board," joked Stuart Spina, a high school student from West Roxbury who was snapping pictures for his "railfan" blog, www.nofreetransfer.blogspot.com. Marcela Alfaro, a student from Costa Rica who was riding from Logan to Wonderland, said that as someone learning English she appreciated the crystal-clear, prerecorded station announcements synched to digital ceiling displays. "It's very good," Alfaro said. "It's fast. It was good when they say where they are. I can understand!" Mia Yandle, a Charlestown native who typically makes a couple of trips each week on the Blue Line, said the cars seemed more spacious, with a nice spot in front of a heater for people in wheelchairs or little children in strollers. But Yandle said she worries how long before "the idiots go to work . . . cutting up the seats."